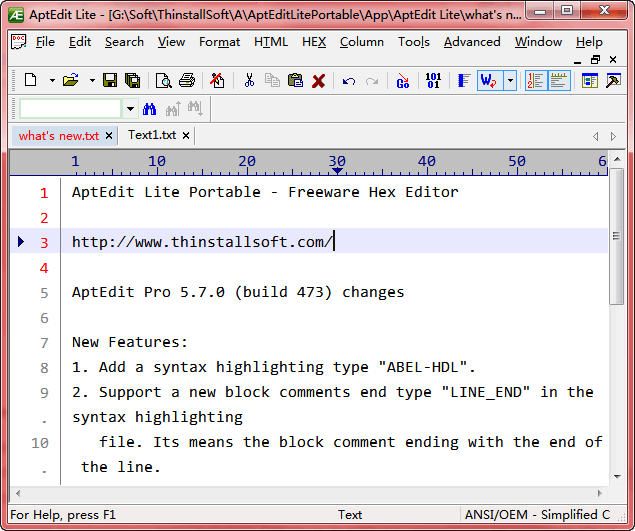 AptEdit Lite is the freeware edition of AptEdit Text Editor. AptEdit Text Editor can launch very fast, almost instantaneously! AptEdit Lite Portable is the ideal text editor, HEX editor, HTML editor and terminal editor for Windows. It offers many powerful features to view and edit just about any text or binary file, and it's an excellent source editor for Web page authors, developers, and programmers. Note: Run AptEditLitePortable.exe to launch AptEdit Lite Portable. AptEdit Lite Portable was updated to version 5.7.1 Build 474 on 2013/5/29. What's new in AptEdit Lite 5.7.0 Build 473? "Reload active iles on startup" cannot work if AptEdit is installed by another user. This entry was posted in Office & PDF and tagged aptedit, aptedit lite, aptedit lite portable, editor, hex editor, html editor, terminal editor, text editor. Bookmark the permalink.